Last week, Solar Power Portal revealed the shortlists for this year’s Solar Power Portal and Clean Energy Awards, sponsored by Trina Solar. More than 60 projects have been shortlisted across 12 categories ahead of what promises to be a glittering occasion at Birmingham NEC’s Hilton Metropole, hosted by stand up comedian Jimmy Carr. In the latest article of a series of shortlist spotlight features, here are the nominees for 2016’s Commercial Energy Storage Project of the year. 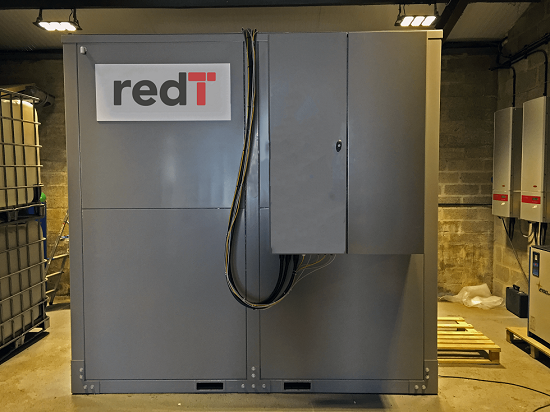 RedT energy worked alongside utility E.ON to install a 5kW, 40kWh vanadium storage battery at the headquarters of warehousing and logistics specialist JB Wheaton, based in Chard, Somerset. The system was paired with a 3MWp rooftop solar install to help match the site’s self-generation as closely to its demand load as possible. JB Wheaton was able to use electricity stored in the battery to charge its fleet of EVs in the evening when they were not in use, thereby avoiding peak-time charges. Additional peak charges were also avoided, allowing the company to “stack” separate revenue streams. The winner of this year’s Commercial Energy Storage Project award will be announced at the awards ceremony on 5 October. Tickets are now available and can be purchased online here, or by contacting sbradshaw@solarmedia.co.uk.